: Board Collector: Victory Wetsuits / Mango Surfwear team board mystery. 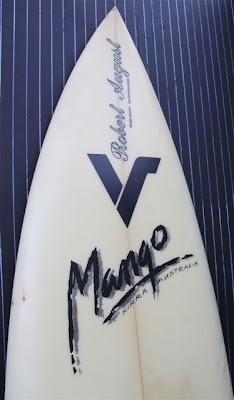 Victory Wetsuits / Mango Surfwear team board mystery. I found this lovely little Robert August thruster on Xmas day in LA. I'm very pleased with it, its a great little board, just my size, nice and cheap, good condition and from a very reputable label, Robert August of Endless Summer fame. But strangely it bears no shapers markings in the foam or on the stringer. I can honestly say this is the first foam and fibreglass board I've ever seen with no markings what so ever under the glass. This troubles me, because I'm desperate to know who the board could have been shaped for. According to the Victory Wetsuits ad in the December 1984 issue of Breakout- California's Bi monthly surf magazine the Victory Wetsuits team included Marc Price from South Africa, Michael Ho from Hawaii, Hans Hedemann from Hawaii and another guy from Australia. Only one of which was sponsored by both Mango and Victory. 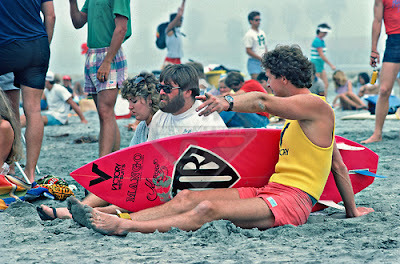 In fact, I really cant think of many surfers in 1983 / 84 who were sponsored by both Victory Wetsuits and Mango surfwear. I can only think of two. Barton Lynch and one other guy. Well, why thank you Barton. My research indicates you could be right. I guess it is possible. A travelling pro surfer, not properly equipped for the changing local conditions, stretched for time and resources, could reach out to a local shaper, hand him a couple of decals and get him smash out a board in time for a heat. 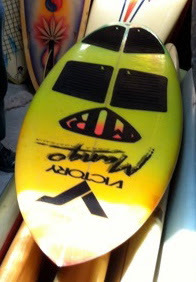 A shaper, hurrying to get the board done in time could also forget to sign it. 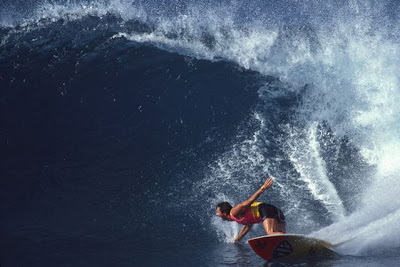 Mark Richards tells a fascinating story on his blog of exactly that happening in Hawaii in 1985 and of Pat Rawson and Ritchie Collins building a board OVERNIGHT for the Billabong Pro, a board the Mark went on to win one of the most important contests of his career on. No one from the Robert August end could shed any light on it. I cant get anything from Mango or Victory. 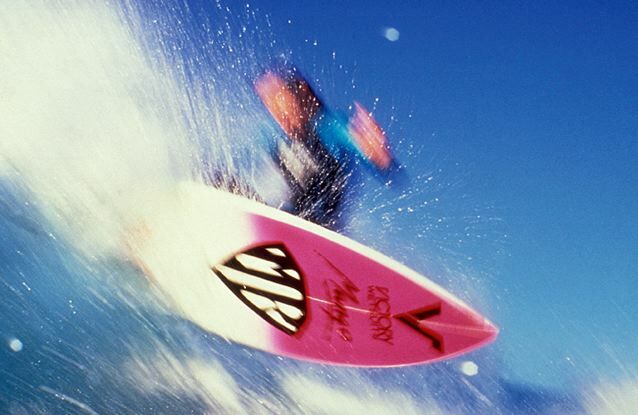 So I'm left to guess it could have been a crass and commercial attempt by a surf shop or surf board maker to shift a few extra units by putting fake sponsors decals under the glass, a popular look at the time, and a look that belonged to a very popular surfer. As such, my excitement could be proof that I'm just another sucker. 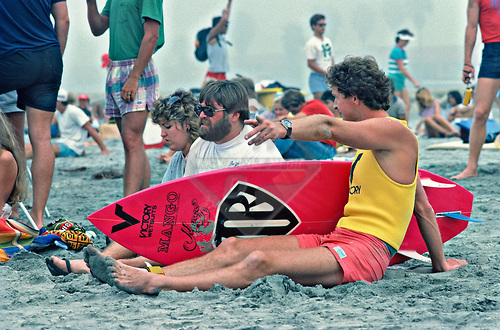 Or maybe there was a heat somewhere, sometime in 1983 in southern California, when the great man's feet graced this very board. Bert's 80's MR competion thruster co-incidently the same dimentions as the mystery board. MR at Tamarama by Sean Davey. Nice logos. Hey mate, this board might be from lennox, Victory wetsuits was the huge brand in town at the time and Mango was owned by Donnie Munro at the time as well, Mango and victory sponsored LE BA our local boardriding club. Hi, do you happen to have the photo second from the bottom (MR coming off the bottom at what looks like sunset) in better quality? or any other photos of him riding that board? thanks.